rofl!! Ok now THAT’S funny! Eh. I think it’s fine. Doesn’t really bother me. I’d buy that, but my cat lives outside. one of the few things in hello kitty that i MIGHT buy. Oh yes, like cats will know this is hello kitty kitty litter. I would never want to use it! I would want to keep it and look at it. And I am a hello kitty fanatic so respect the cat. It is soooooooooooooooooooooo cool. 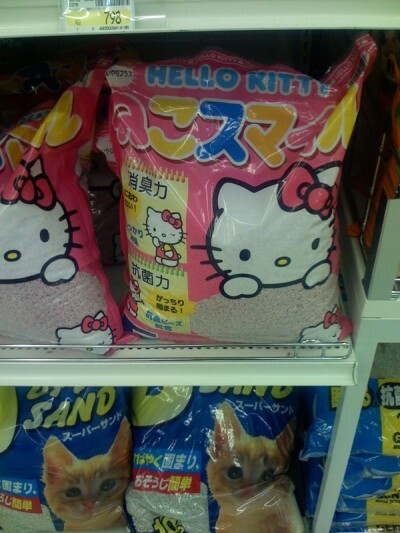 Unlike the hellokitty haters.Where can I get some? Does it smell good? Is it is in the shape of cats? I want some! I think most of the people who see this will end up buying it for collecting even though they have no cats. Im a big hello kitty fan. I’m not sure of that brand of litter though. Of coarse, I only buy the brands that get rid of the smell! Surprsingly (and disappointedly), I cannot find a Hello Kitty kitty litter box. I have found your new mission in life. Aaaaand go! I love Hello Kitty I like stalk her. Having this cat litter would be an honor to me. I would sleep in it every night and would probably eat if im hungry. This is so cool. My cat is named Hello Kitty aswell even though its a boy haha! But who cares. I even painted its nails with pink Hello Kitty nail polish and put Hello kitty’s face on everyone! WOOP WOOP FOR HK!